Among adults aged 18 years and over, age-adjusted rates of current cigarette smoking were higher among adults living in non-metropolitan areas. In 2017, 14.1% of adults aged 18 years and over were current cigarette smokers (age adjusted). 14.9% decrease needed to meet the target. In 2017, 8.8% of students in grades 9–12 smoked cigarettes in the past 30 days. 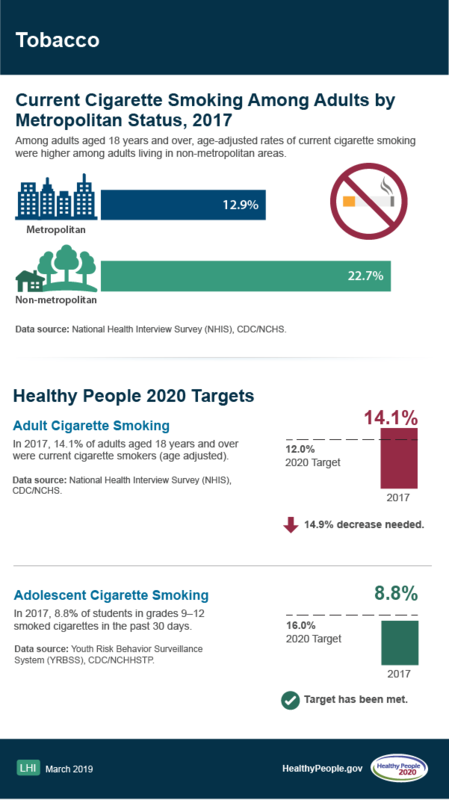 Data source: Youth Risk Behavior Surveillance System (YRBSS), CDC/NCHHSTP.